1. What famous story tells of the wanderings of Odysseus (also known as Ulysses) following the Trojan War? 2. Who is credited with writing the Iliad and the Odyssey? 3. 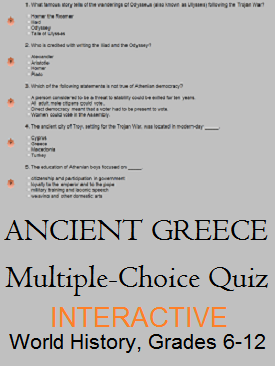 Which of the following statements is not true of Athenian democracy? A person considered to be a threat to stability could be exiled for ten years. All adult male citizens could vote. Direct democracy meant that a voter had to be present to vote. Women could vote in the Assembly. 4. The ancient city of Troy, setting for the Trojan War, was located in modern-day _____. 5. The education of Athenian boys focused on _____. 6. Greek forces defeated a Persian invasion at the battle of _____. 7. Which were enemies in the Peloponnesian War? 8. _____ was the first archaeologist to excavate the ancient city of Troy. 9. _____ dominated the Peloponnesian League. 10. _____ dominated the Delian League. 11. What famous Greek orator spoke against Philip of Macedonia? 12. The Stoics were led by _____. 13. Helots were slaves living in _____ who outnumbered their leaders by twenty to one. 14. What body of water separates the Greek peninsula from Asia Minor? 15. King Leonides of Sparta attempted to hold the pass of _____ against the Persians. 16. In a/an _____, rule is administered by a few elites. 17. The education of Athenian girls focused on _____. 18. Which of Alexander's generals came to rule Egypt? 19. _____ founded the Delian League. 20. _____ was the first law-giver of Athens. 21. Which factor helped to unite the Greeks? 22. The Latin alphabet, used to write English, was created from the _____ alphabet. 23. The spread of Greek culture throughout Alexander's former empire during the third to first centuries B.C.E. is known as the _____ period. 24. _____ served as tutor to the young Alexander the Great. 25. What ancient Greek woman is famous for her lyric poetry? 26. _____ is called the "father of history." 27. What Greek city-state required strict military training for all male citizens, beginning at age seven? 28. _____ is called the "father of medicine." 29. What Greek city-state was the center of classical Greek philosophy and thought? 30. _____ was sentenced to die by drinking hemlock after being convicted of corrupting the youth of Athens.